North Korean leader Kim Jong-un has invited South Korean President Moon Jae-in to visit Pyongyang, Cheong Wa Dae said Saturday. The invitation was delivered via a verbal message from Kim's sister, Kim Yo-jong, who came to the South the previous day to attend the opening ceremony for the PyeongChang Winter Olympic Games. According to Kim Yo-jong who came as Kim Jong-un's special envoy, the North Korean leader is willing to meet with Moon and asked him to visit North Korea at his earliest convenience, presidential spokesman Kim Eui-kyeom said. "She also brought a personally written letter from Kim Jong-un, which stated his willingness to improve inter-Korean relations," the spokesman said after Kim Yo-jong and other high-level delegates had talks and a luncheon with Moon at Cheong Wa Dae. Moon expressed his hope to make the visit happen by creating the necessary conditions, according to the spokesman. The President said the North Korean delegation's visit to the South created the opportunity to hold a peaceful Olympics, relieved tension on the Korean Peninsula and improve inter-Korean relations. "He also asked North Korea to be more open to talks with the U.S., adding Pyongyang-Washington dialogue was also necessary to improve inter-Korean relations," the spokesman said. Kim Yo-jong and other high-level delegates arrived at the presidential office at 10:58 a.m. for the meeting that was followed by a luncheon. The others were Kim Yong-nam, the nominal head of the regime; State Physical Culture and Sports Guidance Commission Chairman Choe Hwi; and Ri Son-gwon, chairman of the Committee for the Peaceful Reunification of the Fatherland. Presidential chief of staff Im Jong-seok received Kim Yo-jong and Kim Yong-nam outside the entrance of the main building of Cheong Wa Dae. Moon greeted them inside. This was the first time for a member of the Kim dynasty to visit South Korea since the 1950-53 Korean War. The delegation was also the first from North Korea to visit Cheong Wa Dae since August 2009 when a group came to express their condolences over the death of former President Kim Dae-jung and met with then-President Lee Myung-bak. From the South Korean side, Im, National Security Office head Chung Eui-yong, National Intelligence Service Director Suh Hoon and Unification Minister Cho Myoung-gyon attended the meeting. 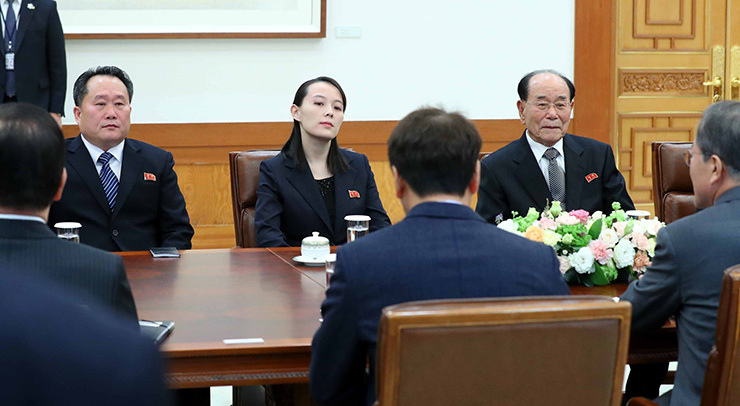 In a visitors' book, Kim Yo-jong wrote, "I hope Pyongyang and Seoul will get closer in our people's minds and that unification and prosperity will come in the near future." After talking for 70 minutes, Moon hosted an hour-long lunch for the visitors. They had a dish made of dried Pollack called "hwangtae," a specialty of Gangwon Province where the Olympics are being held, as well as white kimchi, a type popular in North Korea, and mustard leaf kimchi, a specialty from Yeosu. They toasted with Hallasan soju, a brand from Jeju Island. After arriving in the South, Friday, Kim Yo-jong and Kim Yong-nam attended the opening ceremony of the Olympics, having their first meeting with Moon. 김정은 북한 노동당 위원장이 10일 문재인 대통령에게 평양을 방문해줄 것을 공식 초청했다. 김 위원장은 이날 청와대를 예방한 자신의 여동생 김여정 당 중앙위원회 제1부부장을 통해 남북관계 개선 의지를 담은 친서(親書)를 문 대통령에게 전달하면서 방북 초청 의사를 구두로 전달했다고 청와대 김의겸 대변인이 밝혔다. 김 위원장은 친서에서 '문 대통령을 이른 시일 안에 만날 용의가 있다'며 '편한 시간에 북한을 방문해줄 것을 요청한다'고 말했다고 김 대변인이 전했다. 이에 대해 문 대통령은 '앞으로 여건을 만들어 성사시켜나가자'고 말했다고 김 대변인이 전했다. 친서에서 김 위원장은 '조선민주주의인민공화국 국무위원장'이라는 직함을 사용했고, 김 제1부부장은 김 위원장의 특사 자격으로 방문했다. 문 대통령은 이날 청와대에서 김 제1부부장을 비롯해 김영남 최고인민회의 상임위원장 등 평창 동계올림픽 북한 고위급대표단을 접견하고 오찬을 함께했다. 김 상임위원장은 문 대통령에게 '평창올림픽 개막식이 성공적으로 치러진 데 남북이 함께 축하드린다'고 말했다. 이에 문 대통령은 북한 고위급대표단과 우호적 분위기에서 남북관계와 한반도 문제 전반에 대해 폭넓은 논의를 했다고 김 대변인은 밝혔다. 문 대통령은 특히 '남북관계 발전을 위해서도 북미 간에 조기 대화가 반드시 필요하다'며 '미국과의 대화에 북한이 더 적극적으로 나서달라'고 당부했다. 또 '북한 대표단 방한으로 평창올림픽이 평화올림픽이 되고 한반도 긴장완화와 평화 정착 및 남북관계가 개선됐다'고 말했다.